Have you ever wondered why Russian English-speakers are prone to dropping the article in sentences (“I will drive a car” vs “I will drive the car”)? This may seem like a bit of a stereotype (thank you very much Guy Ritchie! ), but it’s because the Russian language doesn’t have any articles. What this demonstrates is that people will always approach a new language the way they understand their own language. This illustrates how people generally approach a new language through their understanding of their own language’s rules/characteristics. Right now, you’re reading this in English, and in many parts of the world, English is considered a common language, a lingua franca (there are others) and that’s incredibly helpful. It’s good for commerce and politics and serves many other communication purposes. But there are many more languages spoken on our planet. 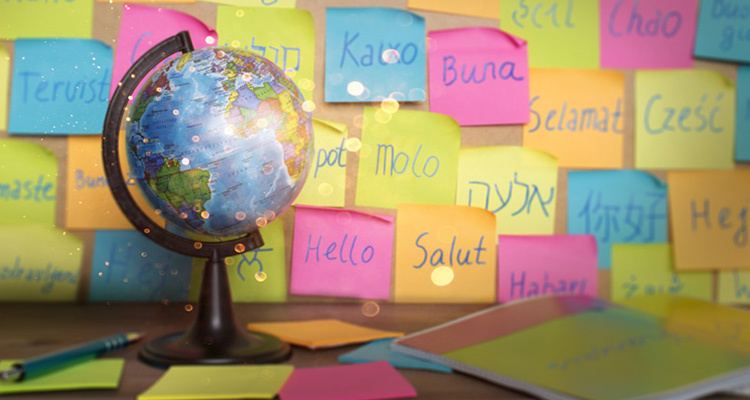 Because there aren’t many monolingual countries on our planet, many different languages need to be accommodated when it comes to approaching education. This is certainly no different in digital learning. But before commencing with any translation processes, it is imperative to find out about how these languages work, as a preparatory step in translation. Understanding how your learners’ languages function, will help you to understand what they might expect from other languages, as second language speakers/learners. As a complete novice in linguistics, I was struck by this video, written by Gretchen McCulloch and presented by vlogger Tom Scott. He succinctly describes how languages ‘function’. It never occurred to me that there was a spectrum, of how languages do this, in diverse ways – different languages arrange and convey meaning in diverse ways. This is called morphological typology. People will always approach a new language the way they understand their own language. All language is made up of morphemes, the most basic meaningful units in any language. In isolating languages (eg: Mandarin) these morphemes are always completely separate words called free morphemes. In agglutinative languages, many morphemes (units of meaning) can be combined, to make up one word holding many arguments/meanings (as in Turkish or isiXhosa). Fusional languages, on the other hand, use a smaller amount, of more complex morphemes, to convey intricate meanings like in Spanish, for example, the Spanish verb comer (“to eat”) holds three meanings – all on one morpheme. Polysynthetic languages (like Ubykh) combine very complex morphemes to create a potentially complex word that can describe a very specific meaning. Knowing this sort of information about your learners’ language forming and discerning processes, is essential for your preparation to work with a translator. It will give you a clear understanding of what kind of experience a different language-learner might be going through, in your digital learning. In South Africa, we have 11 official languages, most of them being part of the Bantu or West Germanic language groups. isiZulu and isiXhosa (Nguni Bantu); Afrikaans and English (West Germanic) and Sesotho (Southern Bantu) and Setswana (Niger-Congo Bantu) are the largest language groups in South Africa. With the other five languages in the minority, those being Tsonga, Ndebele, Northern Sotho, Siswati and Venda (Bantu). Some of these languages are very different from each other. For example, even though both English and isiXhosa are somewhat agglutinative languages, isiXhosa is far more so. This was a big keystone for me in my continuing journey of isiXhosa learning. Often in isiXhosa, an entire word can convey a meaning that would take an entire sentence to convey in English or Afrikaans (for example, the sentence “I do not understand” translates to the single word, “andiqondi” in isiXhosa). There are many things one could derive from this. You could say that isiXhosa speakers might expect to find more meaning in a single word in English because so much meaning can be found in only one word in isiXhosa. However, this is too short a blog post to discuss the thousands of languages out there. But what is unmistakably clear, is that the way in which people think about their own language will undoubtedly be super-imposed onto their understanding of any other language that they might encounter. It’s important to keep this in mind when working in digital learning.